Yesterday, U.S. Ambassador Ryan C. Crocker officially dedicated the new American Embassy in Baghdad in the presence of Iraqi President Jalal Talabani and U.S. Deputy Secretary of State John D. Negroponte. 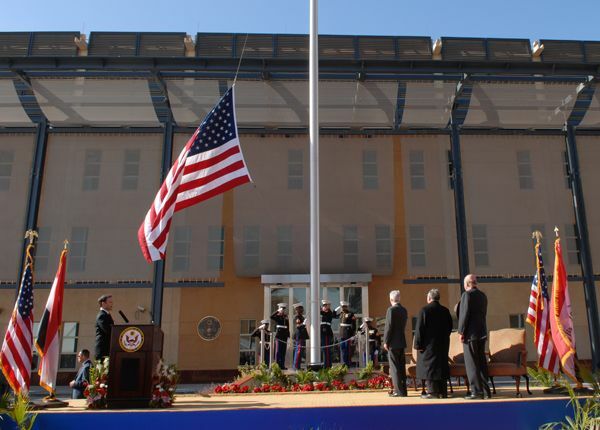 Iraqi dignitaries and close to 1,000 invited guests witnessed the U.S. Marine Security Guard detachment ceremonially raise the American flag in front of the Embassy’s main Chancery Building. This was accompanied by a rendition of the U.S. National Anthem and music from the U.S. Army 4th Infantry Division Band. According to the official news release from Foggy Bottom, this is the largest American Embassy structure to date, and its scale reflects the importance of the U.S.-Iraq bilateral relationship. Construction began in 2005 and was completed in 2008 at a total cost of $592 million. More than 1,200 U.S. diplomats, service members and government officials and staff from 14 federal agencies work and live on the Embassy compound. “did a tour of the new embassy compound. you can read much about it in a vanity fair article of some months ago, but ed’s scoop: nice apartments, good office space, lots of creature comforts unheard of at most embassies (indoor pool, gyms, weight/exercise room, concession space for burger king, etc., etc..) but, as we cannot go out and shop on the local economy [a]s we would normally do, well, everything must be provided inside the hardened structures where we’ll live and work. sucha shame – most people in the foreign service like to get out with the locals – shopping in the souk, buying brochettes from street vendors in conakry, water from vendors in the djma il fna in marrakesh, etc. but, to keep us safe, we’ll here be behind the walls and isolated away from the populace – rather self-defeating of public diplomacy efforts. Ed in Brigantine (occasional comments about living and working in Beautiful Baghdad, the Mesopotamian Metropolis between the Rivers) has not posted anything after May 30, 2008. I am presuming that he has now rotated out of Iraq. He has some photos of the NEC from May 2008 here . Meanwhile Mike in Baghdad, who is currently hosted by BaghdadAnne’s website has also some new pictures of the new embassy compound taken some three weeks ago here . « Insider Quote: Iraq is not a real “tour”?